If you have trouble like me getting to the farmer’s market on Saturday, then you might enjoy what’s coming to Winston-Salem…in what is the up and coming-est part of town. Winston Junction Market, an open-concept indoor market, will be located at 901 North Trade Street behind Earl’s. Dalholt wanted to control the vibe and the look of the space so he and his team are providing tables and custom signage. Vendors won’t event have to bring tables or signs. Menu boards will also be very visible in the event that if you’re waiting in line, you can read the menu easily as you wait. And just so you know, Dalholt has a way with aesthetic. His tables and woodworking are incredible, so this place is going to look great. Patrons are welcome to come and just hang out. Seating will be provided on the patio on top and rows of seating are provided throughout the length of the market indoors. You’ll be able to shop for food, order something from vendor like Wine Merchants and Vin 205 Bistro, Lavender and Honey Kitchen, Golden Rule Kombucha, buy plants from House of Plants. You’ll be able to find artisanal products and a few farmers will be there as well. Wanna go? Grand opening is Saturday, March 30th 11:30am-2:30pm. It will be open each Saturday with hopeful plans to extend hours in the future. I’ll be stopping by there tomorrow to get a closer look so more information to come! Until then, follow Winston Junction Market on Facebook for updated vendor announcements and future dates. This entry was posted in foodie b'eat, You Should Eat Here! and tagged artisanal, chef, Downtown Winston-Salem, family, Farmer's market, food market, foodie, grocery, maker, market on March 18, 2019 by triadfoodies. Here’s this year’s list of our favorite things…a good list this year with Got to be NC products and one or two out-of-towner’s but at least one was purchased at a locally owned business. Links to the companies that make the products are in the list! Merry Christmas! Merry Christmas! We can’t believe this season happened upon us so quickly! It was so fast we nearly forgot this beloved (we hope) tradition. This year, most of our favorite things just so happen to be “Got to Be NC”. Speculoos Cookie Butter: This is almost Ava’s favorite thing. We are on a roll with the cookie butter. If you like the original from two years ago you will love this. This has the cookies (from last year) not all the way mushed into cookie butter. So you get crunch and cookie butter and it’s still meltable and pourable after melted and we really just eat it off the spoon and enjoy. You do whatever you want. Located at Trader Joe’s. From Beck: Gorilla Grains Granola: Let me tell you, the butteriness of this granola will make you so happy to be alive. You really will just consume it right out of the bag and not bother with all that fussy stuff like yogurt or milk (unless it’s to drink it). It’s just too good for snacking. And you can get it with cranberries and other troublesome things in it but the original is just too darn fabulous to pass up. Beck will not eat any other granola. He asks if it’s this. He can tell with just one bite. How this woman who owns this company is not a millionaire used to be a mystery…but a recent conversation with owner Alicia Rehburg explains that she keeps it small so she can have the best quality control possible, but who knows what the future holds? You’ll have to find Gorilla Grains on Facebook and order personally by calling or messaging. And you can find her just about every weekend at the Greensboro Farmer’s Curb Market. Also at Summerfield Farms. Powdered Sugar Spoon: Isn’t it like totally cute? I mean, enough said. We found this at Southern Home & Kitchen in WS. You can probably find them at most kitchen stores. This will give your desserts, coffee or whatever a nice teeny tiny dusting that’s just enough with not a big mess. LOVE! So that’s our favorite things 2014. If you think there’s something we should try that ought to be on our list, suggest to us please! What are some of your faves this year? 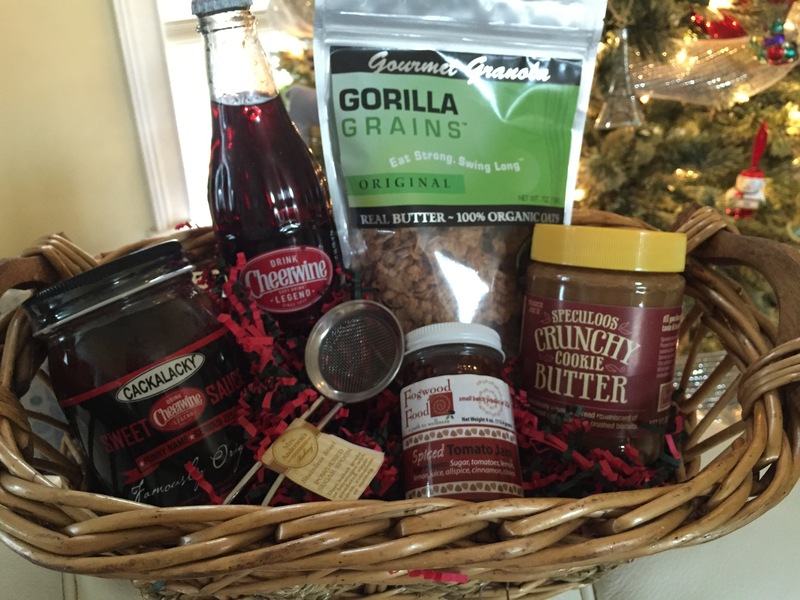 This entry was posted in foodie b'eat, product reviews and tagged Farmer's market, favorite things, Got to be NC, products on December 20, 2014 by triadfoodies.